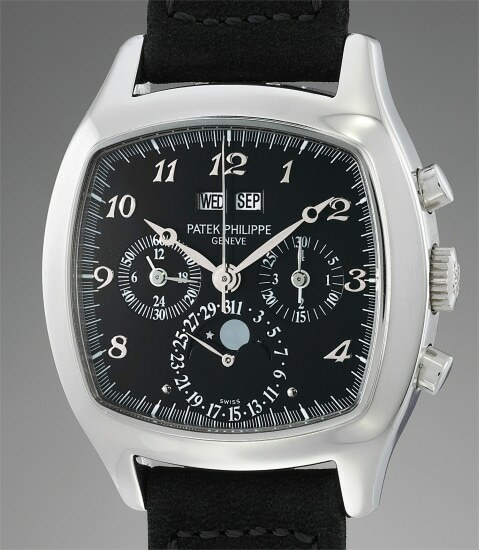 Accessories: Accompanied by Certificate of Origin, Patek Philippe Extract from the Archives confirming production of the present watch in 2001 with black dial and Breguet numerals, and its subsequent sale on April 29, 2002, hangtag, setting pin, fitted box and product literature. Launched in 1994 and in production for about 8 years, Patek Philippe’s reference 5020, also known as the “TV Screen” due to its particular cushion shape was an alternative to the reference 3970 featuring the same complications (and mechanically identical): perpetual calendar with leap year, 24 hour indicator and chronograph. The reference 5020’s avant garde design and tasteful proportions set it apart from other perpetual calendar chronographs from Patek Philippe. However, its unusual case shape elicited lukewarm reactions from clients leading to very low production numbers. It is believed that about 200 examples of reference 5020 were ever made, either in yellow, pink or white gold as well as in platinum. Platinum models were available either with a silver dial with Breguet numerals or with a black dial and diamond markers. In fact so rare is the platinum version that only 4 models with silver dial and Breguet numerals and 3 examples with black dial and diamond markers are known to date. What truly sets the present lot apart, making it unique, is the rich deep black dial adorned with Breguet numerals making this piece the only reference 5020 in platinum with this dial layout known and documented in the Patek Philippe Certificate of Origin. The ultra-rarity of the 5020, in any metal, already makes it covetable but scholarship shows that less than 20 platinum models were produced and amongst them only one in the present case/dial combination.